This pretty little jewel of a church is set on the edge of Feltwell, one of those large, working villages which are a feature of south-west Norfolk. It is certainly the prettiest little thing in town, but thanks to the presence of the grand, beautiful church of St Mary a quarter of a mile off in the centre of the village, this church was declared redundant in the early 1970s. It is now in the care of the Churches Conservation Trust. I couldn't help thinking that, in these days of falling Anglican attendances and rising maintenance costs, the parish might rather have wished that they'd declared the other one redundant and kept this one in use instead. But be that as it may, it is still of benefit to those of us who are pilgrims and strangers of a spiritual bent, those of us who might be looking for a cool, worshipful space in the middle of a busy day, because of course Feltwell has two of them, and they are both open daily. You don't have to be an architectural historian to see at a glance what has happened here. This church was considerably extended towards the end of the medieval period with aisles and a clerestory, but since that time the tower has fallen and the chancel has vanished completely. 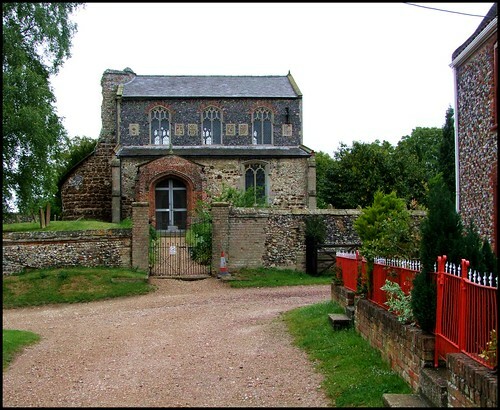 The chancel was demolished in the 1860s, not a common way of preparing a church for the Victorian Anglican revival, but also not unknown elsewhere in Norfolk. The demolition was apparently carried out by Frederick Preedy, who was working on the restoration of St Mary at the time. I wonder if he was looking for building materials. The carstone round tower was still standing then. It must have been similar to the one at Bexwell, not far off. But it collapsed one night in 1898. Perhaps the most striking feature of the building is the set of six flushwork panels, four with monograms, picked out in stone on the south side of the clerestory. Presumably, the monograms refer to 15th Century donors - those to the east appear to read Tomas Deye. Inside the church is a fragment of a memorial bearing an inscription to a Robert Dey, who died in 1698, and might possibly be a descendant. The other two are more mysterious: one is probably a crowned ST for St Thomas, but what is the one with smaller letters above a large capital D? The churchyard is strangely long and narrow, the church set at the extreme west end of it. This was never a big church, and the mixture of flint, freestone, carstone, red brick and (on the north side) yellow brick gives it a character quite unlike that of any other church in Norfolk. You step into a large, square space, as wide as it is long. There is little coloured glass, but there is only one window in each of the aisle walls. This gives a curious effect, with light shed into the building from small windows to east and west, but mostly from above, in the delicious clerestory. This creates a luminosity in the upper white walls, almost a theatrical effect, and a sense that this really is a place apart. The atmosphere is utterly charming: this is a church which has not changed much at all since the nineteenth century. It is a memory of our Victorian rural ancestors, who would not be out of place here even now in this dusty silence filled with slanting light. Beneath the tower, two chairs sit beneath a cross, uncannily like a confessional. The grand Norman tower arch has survived, and the two arcades are quite out of kilter with each other, one being elegantly Early English, the other blockish late-Perpendicular. The simple sanctuary appears wider than it is, thanks to the breadth of the east wall. Mortlock mentions the cross, carved by a prisoner of war when this church was used for Catholic Masses by POWs during the Second World War. After the fall of the tower the five bells were melted down, but three of their clappers survive, and are set on the west wall beside a verse. It concludes: ...we called you from your cottages and from the old Fen shore; with lofty tower one morn we fell in Eighteen Ninety Eight, no more we'll call you to your prayers for silence is our fate. And that precious silence lives on for us today.